A glorious run of concerts, feastings, and more art-filled doings await. Where are the arts all abloom and beautifully lit and serenaded by violins and accompanied by edibles galore? In Napa Valley, in July, during Festival del Sole. MULTI-DAY FESTIVAL, MULTI-HAPPENINGS: The beauty of an art-focused, music-tastic gathering that is spread out over nearly a third of a month is this: It doesn't have to be about one or two things. Of course, the focus will never stray far from the intent of the happening, but given a little breadth and various venues and some whimsical vision, a multi-day party can obtain a lively lift-off of sorts. 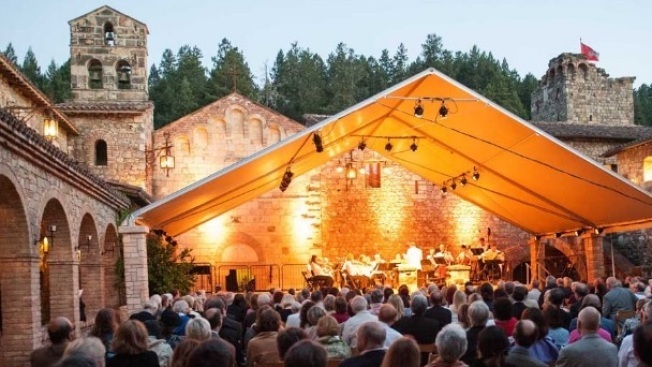 Look to Festival del Sole, the July soiree that alights in Napa Valley for several days and nights, bringing with it exquisite eats and special orchestra appearances and special thespian appearances and jazz greats and young performers and exercise. That last addition may seem a bit incongruous at first glance, but the 5K and 10K that's folded into the fun just proves that there's room for a lot, from many different corners, at Festival del Sole. But after a full decade of concerts and solo shows and wine spotlights and such, the arts-plus party has a pretty good handle on how seemingly disparate events complement each other nicely. And "nicely," and equally as nice variations on the compliment, may be said a few times this summer when the festival spreads out from Friday, July 17 through Sunday, July 26. TASTE OF NAPA... is a savory centerpiece of the week, and it gets things revved pretty quickly on the second day (that's July 18). Over "70 wineries, restaurants, and food artisans" will serve up bites with local bite and libations with a deep N.V. backstory. More goodness is to come: Herb Alpert and Lani Hall are on the joyful jazz brigade, a live script-reading with a "celebrity cast" will bring classic film goodness to life, and accoladed violinest Midori plays out the final night. Plus? Actor Kevin Spacey makes a gala appearance, the free Community Concert presents "Angel Heart," and several principal dancers from top ballet troupes will tie on the toe shoes and astound. And, yes, that aforementioned 5K and 10K will lend the love to arts programs in Napa Valley. Also: The Russian National Orchestra shall bring Beethoven, and his "Symphony No. 9," to moving, thunderous, feel-it-in-your-solar-plexus life. Yep, a multi-day, multi-discipline happening in an already arts friendly spot like Napa Valley insures you'll get a bit listy with the many lovely to-dos, and it is hard to stop the hand-flailing and excitement. So trot this way and see all that this European-style, swanky-cool party has to offer. The bag is deep and the gems inside are plentiful.